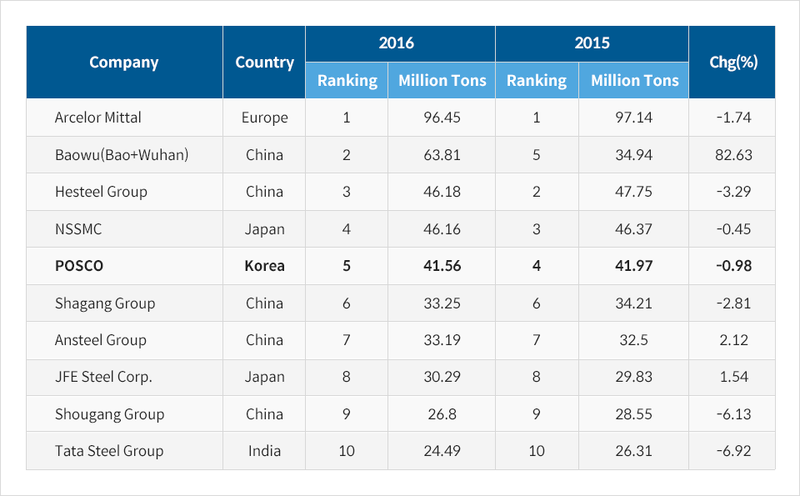 POSCO firmly maintains top position as world’s most competitive steelmaker (click here for related article) whilst The Nikkei reports POSCO as world’s most profitable steel company. The paper states POSCO exceeds 90% of the world’s largest producing company, Arcelor Mittal, caused by advancement in POSCO’s profitability of overall businesses including successful business negotiations, secure operation management, and PT Krakatau POSCO’s transition to surplus. On February 23, POSCO announced its second quarter fiscal earnings achieving $6.87 billion, up 8% from same time last year while at the same period recording $734 million in operating profit, a 40.5% surge owing to robust earnings at overseas major businesses such as POSCO Maharashtra, Indonesian integrated steel mill and cold-formed steel manufacturing company that achieved its largest quarterly profit thus far. Additionally, POSCO is seeking to achieve a two-figure operating profit in the third quarter having already managed a 10.7% rise, which is 2.5% increase from last year. Meanwhile, India’s Tata Steel landed second place driven by Indian market’s overall growth causing a surge in operating capacity. Japan’s JFE Holdings and NSSMC stand third and fourth place respectively by expanding the sales of high-value products focusing on automotive steel sheets. Baowu Steel, on the other hand, is said to be challenged with domestic surplus compared to its high production capacity while lacking in product competitiveness. POSCO has continuously pursued expanding its world premium high-value products since 2015 and as of the latter 2017, sales of high-value products have surpassed half the total sales. Furthermore, POSCO reported that current world premium product sales of 55.6% will feasibly reach the goal of 57.0%, forecasting ongoing profit growth. Compared to earlier this year, this year’s consolidated and non-consolidated sales goals have increased $1.96 billion and $1.16 billion respectively, amounting to $57.2 billion and $29.5 billion each.